This was published originally in The Catholic Weekly at the start of Advent. With the start of Advent we begin a new Church year and it’s tempting to make some new year’s resolutions, starting with making this our family’s best Advent season ever. A quick look around the internet and talk to friends yields plenty of ideas for making the season a bit special for the kids while guiding them (and reminding us parents) to cultivate a sense of patient, hopeful, expectancy for the arrival of Christ. But I know I’m not going to do too much, that’s not exactly my style. Instead I’ll probably be doing as little as we can while aiming for maximum impact. 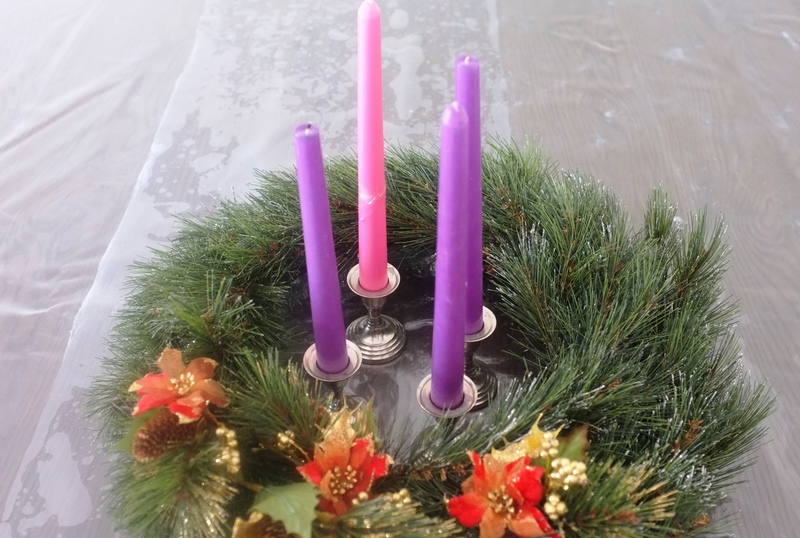 There will be an Advent wreath on the dinner table, with the three purple, one pink, and one white candle, and we’ll light the appropriate candles before saying grace. We have a larger, square-shaped, table now, so that will actually work without us having to worry about someone knocking a candle over or burning themselves. We’ll say a short advent prayer at bedtime, which will replace the short prayer for the souls in purgatory we have been praying throughout November. The websites www.loyolapress.com and www.cathfamily.org have great ideas and resources for celebrating the true meaning of Advent and Christmas with children. A Jesse tree would be nice, but maybe for next year. We have a beautiful religious advent calendar with little doors to open and figures to take out, which over four weeks builds up a nativity scene. I love the idea of placing a piece of hay in the manger for each good deed a person does, but I don’t like the idea of having hay in the house for my children to freely access, so we’ll skip that again this year. I like to have a box of Christmas-related books available though, for a variety of ages, for dipping into when anyone has a quiet moment to spare. Written down like that it looks like quite a lot, but in reality it’s very little, requiring about an extra minute a day, all up. So not too much for the children to do, or me and Peter to do with them. The main thing I will be doing is praying one or two parts of the Divine Office every day, which I always seem to be able to do during Lent, Easter, and Advent and Christmas, and I always love it. Maybe this start of a new Church year I’ll be able to keep it up throughout the whole year, that and trying to maintain a constant dialogue with God throughout the day; cutting down on the temptation to running monologues with myself. To be honest, I think this is the one thing necessary, whatever the season. So this advent I will mainly be trying to do less, and pray more. I expect that this seeming little thing, which is mainly to be more mindful of God’s presence throughout the day, should have the greatest impact on teaching my children how to know and love Jesus better this Christmas. I love how you are adding extra prayer time into your Advent days as another way to prepare for the Christ Child! Many blessings to you! Thank you Tracy, same to you and your family!